US Democratic presidential challenger John Kerry has vowed to relax limits on embryonic stem cell research if he wins the White House election in November. 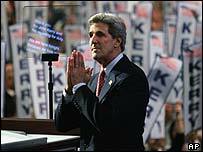 "I want you to know that help is on the way," Mr Kerry said in a radio address. His comments were timed to mark the third anniversary of President George W Bush's restrictions on such research. Ron Reagan, son of the late Republican president, addressed last month's Democratic Party National Convention calling for an expansion of research. Ronald Reagan died on 5 June a decade after announcing he had Alzheimer's disease. The use of embryonic stem cells is controversial because a human embryo a few days old is destroyed when the cells are extracted. In August 2001, the president cut federal funding for such research, citing ethical concerns about performing experiments involving fertilised human embryos. But Mr Kerry said more than 100 million Americans suffered from illnesses that could one day be cured with stem cell therapy. "Here in America, we don't sacrifice science for ideology," he said. "Come next January, when John Edwards and I are sworn into office, we're going to create a new anniversary, one that will be a cause for celebration." "We're going to lift the ban on stem cell research," he said.